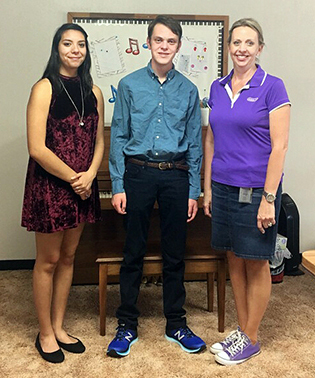 Piano students from the studio of Laney Rountree performed April 28 and May 17 in the National Piano-Playing Auditions, sponsored by the National Guild of Piano Teachers, Teacher Division of the American College of Musicians. The auditions were held at First Evangelical Presbyterian Church and First Christian Church. Each student was striving for Hobbyist (1-8 pieces, non-memorized), Pledge (1 piece), Local (2-3 pieces), District (4-6 pieces), State (7-9 pieces), National (10-14 pieces) or International (15-20 pieces) honors. All repertoire, other than Hobbyist, must be memorized and played in its entirety, and each student must be able to play the scale and cadence/chord for each piece programmed. Musicianship Phases such as Transposition and Sight-Reading may be added to the program as a separate piece. The American College of Musicians evaluates each student’s performance based on their presentation of baroque, classic, romantic and contemporary works. Each student performs in the presence of a professional adjudicator chosen by the national organization who examines their repertoire and critiques them on a report card. This year’s adjudicators were Shane Galentine of Emporia, Kans., and Kandi Branch of Artesia. Galentine maintains a private teaching studio in Emporia. He received his Bachelor of Arts in Music from Emporia State University in 2006 and completed his Master of Music in 2013 at Kansas State University in Manhattan, Kans., with a joint concentration in piano performance and piano pedagogy. In addition to teaching, he serves as pianist/organist at Highland Park United Methodist Church in Topeka, Kans. Branch has had a private piano studio for several years. She received a Bachelor of Science in Elementary Education with an emphasis in music and language arts from Eastern New Mexico University in 1991 and is a member of Faith Baptist Church’s worship team, playing piano and keyboard. More than 100,000 enthusiastic piano pupils participate in the National Piano-Playing Auditions annually, which are held in more than 880 music centers worldwide. Each entrant is given a gold, silver or bronze embossed pin, a report card, and a year’s membership in the National Fraternity of Student Musicians. Students entering National or International programs for five years or more also receive a Composer Pin. The organization was established in 1929 by Dr. Irl Allison, and its national headquarters is maintained in Austin, Texas. • Aubriegh Eslick: 20 pieces, Superior rating. Aubriegh is the daughter of Alissa and Tyrell Eslick, and this was her first year to audition and first performing an International program. • Ann Greenwood: 15 pieces, Superior-Plus rating and Top Talent Award. Ann is the daughter of Sara and Adam Greenwood, and this was her first year to audition and first performing an International program. • Hannah Williams: 11 pieces, Superior rating. Hannah is the daughter of Laura and Mark Williams, and this was her third year to audition and second performing a National program. • Olivia Torrez: 10 pieces, Superior-Plus rating and Top Talent Award. Oliva is the daughter of Becky and Tony Torrez, and this was her ninth year to audition and ninth performing a National or International program. She received a Composer Pin. • Braden Fuentes: 10 pieces, Superior rating. Braden is the son of Angie and Ben Fuentes, and this was his fourth year to audition and third performing a National program. • Jade Throneberry: 10 pieces, Superior rating. Jade is the daughter of Lynette and Kevin Throneberry, and this was her 10th year to audition and seventh performing a National or International program. She received a Composer Pin. • Lowell Irby: 10 pieces, Superior rating. Lowell is the son of Susan and Eugene Irby, and this was his 11th year to audition and 11th performing a National program. He received a Composer Pin. 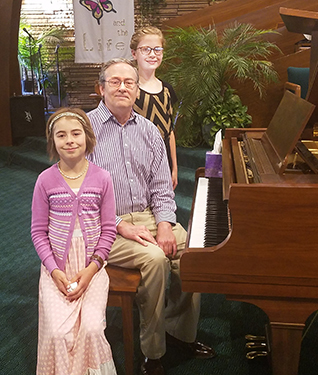 Students of Laney’s Music Studio also performed their Spring Recital May 20, at which they were presented with awards and composer statues. Torrez was also presented with special congratulations and a gift upon her graduation from Artesia High School. She plans to attend Eastern New Mexico University in Portales to study music.